Make a treat perfect for the holidays with Egg Nog White Chocolate Bark. This sumptuous white chocolate bark gets its egg-noggy appeal from nutmeg. Microwave chocolate in large microwaveable bowl on HIGH 2 min. or until almost melted, stirring every 30 sec. Stir until chocolate is completely melted. Stir in remaining ingredients until blended; spread immediately onto foil-covered baking sheet. Refrigerate 4 hours or until firm. Break into pieces. 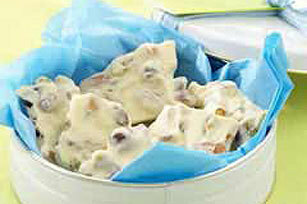 Balance your food choices throughout the day so you can enjoy a serving of this delectable white chocolate bark. Prepare using your favorite PLANTERS Nut Mix.